What are the primary motor symptoms of Parkinson’s Disease? There are five primary motor symptoms of Parkinson’s disease: tremor, rigidity, bradykinesia (slow movement), postural instability (balance problems), and walking/gait problems. Observing one or more of these symptoms is the main way that physicians diagnose Parkinson’s. It is important to know that not all of these symptoms must be present for a diagnosis of Parkinson’s disease to be considered. In fact, younger people may only notice one or two of these motor symptoms, especially in the early stages of the disease. Not everyone with Parkinson’s disease has a tremor, nor is a tremor proof of Parkinson’s. If you suspect Parkinson’s, see a neurologist or movement disorders specialist. Characteristically occurring at rest, the classic slow, rhythmic tremor of Parkinson’s disease typically starts in one hand, foot, or leg and eventually affects both sides of the body. The resting tremor of Parkinson’s disease can also occur in the jaw, chin, mouth, or tongue. In addition, some people with Parkinson’s disease can experience a feeling of internal tremor, which is not necessarily noticeable to others. Rigidity refers to a tightness or stiffness of the limbs or torso. Rigidity, especially in the early stages of the disease, may be wrongly attributed to arthritis or orthopedic problems, such as a rotator cuff injury. Greek for “slow movement,” bradykinesia is a frequent symptom of Parkinson’s disease and related movement disorders. In addition to a general slowness of movement, the bradykinesia of Parkinson’s disease is typically demonstrated by a reduced or mask-like expression of the face (hypomimia or facial masking), a decreased blink rate of the eyes, and problems with fine motor coordination (for example, difficulties buttoning a shirt). Having trouble turning over in bed and slow, small handwriting (micrographia) are other signs of bradykinesia. More pronounced in the later stages, postural instability includes the inability to maintain a steady, upright posture or to prevent a fall. Such balance problems in Parkinson’s disease are associated with a tendency to list or fall backward (retropulsion); in fact, a light push can cause the individual with Parkinson’s disease to continue stepping backward or to even fall down. Bradykinesia and postural instability both contribute to walking—or gait—difficulties in Parkinson’s, particularly as the disease progresses. A common, early symptom of Parkinson’s disease is a decrease in the natural swing of one or both arms when walking. Later, steps may become slow and small, and a shuffling gait (festination) may appear. Gait problems in Parkinson’s disease can also include a tendency to propel forward with rapid, short steps (propulsion). People with advanced Parkinson’s disease may experience episodes of freezing, in which the feet appear to be glued to the floor. Dystonia is a movement disorder in which there are involuntary and repetitive muscle movements that cause a part of the body to twist or assume a particular posture. Various body parts can be affected by dystonia in Parkinson’s, including the eyes, neck, trunk and limbs. Dystonia can be painful and can interfere with a person’s desired movement. It’s important to note that many people with PD do not develop dystonia and conversely, there are numerous causes of dystonia which are unrelated to PD, including genetic disorders, brain lesions, and medication side effects. In addition to the five core motor symptoms of Parkinson’s, changes in the voice are commonly experienced. Generally, these are believed to be at least partly due to bradykinesia. The voice may become softer, or it may start off strong and then fade away. There may be a loss of the normal variation in volume and emotion in the voice, so that the individual may speak in a monotone. In more advanced Parkinson’s, speaking may become rapid, with the words crowded together, or stuttering may occur. What are some of the non-motor symptoms of Parkinson’s? Because Parkinson’s disease is a type of movement disorder, the associated non-motor symptoms can often be overlooked. However, there are several common symptoms of Parkinson’s disease that do not primarily involve movement. A reduced sensitivity to odors (hyposmia) or a loss of smell (anosmia) is often an early symptom of Parkinson’s. In fact, hyposmia and anosmia may be experienced months or even years before the traditional motor symptoms of Parkinson’s disease emerge. Sleep problems are commonly experienced by people with Parkinson’s. The inability to fall asleep, or primary insomnia, is less common than the inability to stay asleep, or secondary insomnia. Other individuals with Parkinson’s disease have vivid dreams, although these are more typically due to side effects of medications for PD. Depression and anxiety are fairly common non-motor symptoms of Parkinson’s. They can range in severity and may improve with Parkinson’s disease treatment, medications, and “talking therapy” or psychotherapy, such as cognitive behavioral therapy (CBT). Parkinson’s disease psychosis is a non-motor symptom of Parkinson’s disease that causes patients to experience hallucinations and/or delusions. More than half of all patients with Parkinson’s disease eventually develop symptoms over the course of their disease. Fatigue is a complex symptom of Parkinson’s disease that is not fully understood. It is known, however, that fatigue is significantly associated with depression and sleep disorders. Particularly in more advanced Parkinson’s disease or in older people with the disease, problems with thinking, word finding, and judgment are common. If these symptoms occur in the early stages of illness, however, they may be symptoms of a related disorder (eg, dementia with Lewy bodies) rather than idiopathic Parkinson’s. Many individuals report difficulties in multitasking and organizing daily activities. Confusion may also be a side effect of some Parkinson’s disease medications. Loss of weight is a common symptom, particularly in the later stages of the illness. If weight loss is significant and unintended, your physician should perform an examination to exclude other medical causes of weight loss. Disturbances of the gastrointestinal system are common. Constipation, in particular, occurs frequently because Parkinson’s disease may slow the automatic movement of the digestive system; however, side effects of medications may also contribute to constipation. 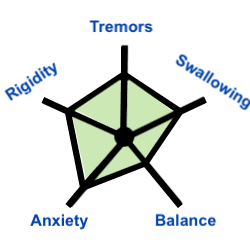 Separate from the balance problems of postural instability but contributing to gait problems, lightheadedness or a faint feeling occurs often with Parkinson’s. This symptom is related to the body’s inability to quickly regulate blood pressure, particularly when sitting up from a lying position or standing from a sitting position. When severe, lightheadedness may cause blackouts or fainting. Urinary frequency (the need to urinate often) and urinary urgency (the feeling that one must urinate right away, even if the bladder is not full) are other possible symptoms. Urinary problems may be worse at night, when a person is lying flat. There may also be problems with initiating a urine stream (urinary hesitancy), slowness of urination, and overfill of the bladder. Reductions in sexual desire, or libido, is another non-motor symptom of Parkinson’s disease that is often under-recognized. Treatment with Parkinson’s disease drugs frequently improves sexual desire and, in some cases, even increases it to a troublesome level. In men, the inability to achieve or maintain an erection (impotence) can occur; however, impotence may also be related to other age-related changes in the body or other conditions. Excessive sweating is a relatively common sign of Parkinson’s, particularly if the disease is untreated. It happens most often in the upper body. Individuals with Parkinson’s disease may have an increased risk of melanoma, a serious type of skin cancer. As a result, people with Parkinson’s disease should undergo annual skin examinations with a dermatologist. If you notice any troubling skin lesions, be sure to talk to your physician about them. The disease can affect the brain in ways that cause modest personality changes over time. Also, Parkinson’s medication can, in some instances, cause impulse control disorders (ICD). An ICD can manifest as hypersexuality, pathological gambling, and other impulsive behaviors.